I have long considered a trip out into the Chianti wine region a “must do” for my trip to Florence. Before leaving Canada, I had looked up a number of providers and settled on a few that I thought looked interesting. I discussed it with my Busabout guide between Venice and Rome since I knew that they offered a wine trip as an optional excursion and she told me not to worry – there would be a trip and I could book on the next coach trip as I travelled between Rome and Florence. Problem solved! Or so I thought. The guide that I had between Rome and Florence, a week later, told me that the wine trip wasn’t quite running yet and that she had no information. It was a Sunday, so she tried to contact her boss and then she contacted the guide on the coach ahead of us before finally, late in the evening, telling me that I would have to book my own trip through a provider of my choosing. PLUS Hostel gave me a brochure for an afternoon wine tasting trip, on a large coach bus, at the price of €45 with only two stops included. Hmmm… I wanted to have fun wine tasting, not do a massive, informal and likely rushed trip. I remembered from my research that there was a travel company specializing in day trips, from Florence, for 18-30 somethings. A quick Google search found what I was looking for – Italy on a Budget – and their office was, fortunately, very close to the hostel. I set off, hoping that they would be open early and hoping that they would have a spot for me. The people in the office were funny, vibrant and very accommodating. They had two spots left on their Chianti tour, which would depart in less than an hour, so I snapped one up for the reasonable price of €50. We would stop at two wineries – one would be a bit larger and a bit more industrial while the second was much more of a family production. I need to be honest – I was already forming a bias as I really love small wineries staffed by passionate wine people. After the two stops, lunch included, we would venture to one of Tuscany’s small hill towns, San Gimignano. 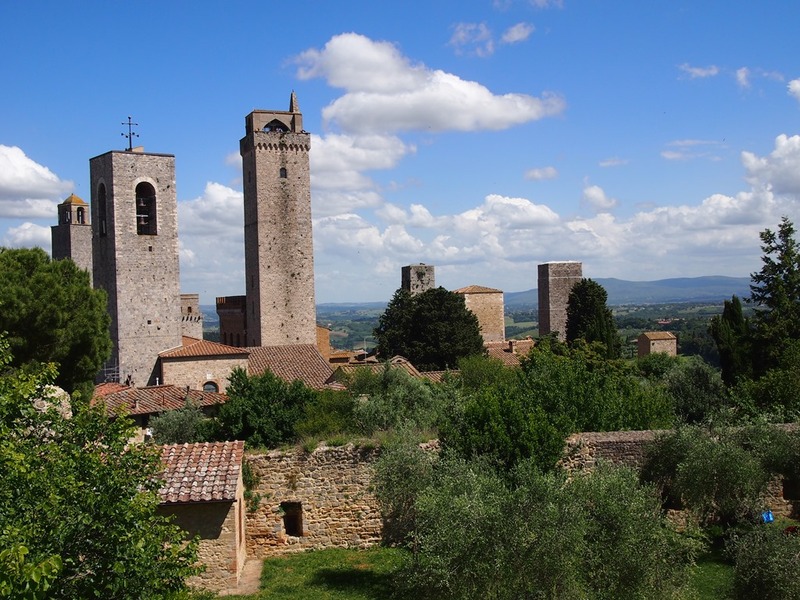 They offered me a deal on a trip running the next day, called a Taste of Tuscany, which would visit Monteriggioni, Siena, another winery and then culminate with a Tuscan meal out in the country. What could I say? I had already walked around Florence, had no plans to do the galleries and would still have hours in which to visit the city. Quickly rationalizing away any budget concerns, I shelled out another €45 on the spot. I had faith that this would be an excellent trip. I was correct. The wine tasting trip was the absolute best thing I did while in Tuscany. The company had two 8-passenger vans, driven by two good friends, Nico and Fanfa, who would spend the trip passing each other and making jokes. They were extremely passionate about Tuscany and they had a huge amount of pride in the food, wine and natural beauty of the region – constantly encouraging us to admire the scenery, drink more wine and enjoy the Tuscan experience. The small vans allowed us passengers to not only get to know the guides, but also each other, and I coincidentally ended up in a van with four francophone Canadians… and a girl from Australia who was living in the UK. We also stopped for a few photos, heading out into the fields to get the best vantage point. I really don’t think that would be an option on a massive coach trip! Our first stop was Tenuta Torciano, a beautiful winery that has been producing wine for over 300 years, where we only visited the tasting room. I’m not sure if production was done on site, as I saw no evidence that it was, but the gardens were stunning and they had an excellent set up for us. Their hostess was very passionate about her wine, telling us that she didn’t want anyone to spit or pour out her production. She also attempted to evaluate our tasting methodology, telling everyone that they were doing it wrong, and showing how we should taste. I think they were used to people, especially with this group, who didn’t know anything about wine and although I tried to do it her way, old habits die hard and I went back to my way. I also prefer to hold the glass in my left hand so I can make notes with my right. What can I say? Wine nerd. There was a white and a red already poured and she wanted us to start with the white, forbidding us from touching the red. It was made from a grape called vernaccia, and since it was grown in the authorized area near San Gimignano it was called “Vernaccia di San Gimignano DOCG”. The Italian wine regulations can be very difficult to understand – I’m sure there are wine experts out there who have yet to achieve mastery – and she attempted to explain them to us, but I think it just left people more confused than anything else. I know a few of the most important ones, which is good enough for me at this point. There was a small plate of food handed out for us to try after we tasted the wine. We had chips (which usually goes better with sparkling wine), a fatty salami, some semi-hard cheese and bread drenched in olive oil. I thought that the salami went best with the wine and if the cheese had been a bit softer I think it would have provided a fair competition. We were also led through a tasting of the red wines, starting with a Chianti DOCG before moving onto a Chianti Classico DOCG and a Brunello di Montalcino DOCG which – we were strictly told – we were not to pour out under any circumstances. I saw one girl sneakily switch her wine with her friends because she either didn’t like it or couldn’t finish it. The last red wine that we tried was a Baldassarre “Super Tuscan” IGT… although we did finish off with a Vin Santo, a traditional Tuscan dessert wine. We were given small, dense cookies to dip into our dessert wine… but I really preferred keeping the two separate. There were some good and bad parts of this experience. The good was the food and the fact that they tried show people a little bit about food and wine pairing, albeit in a slightly strange manner. I think it would have been beneficial to have some choices on there that would have worked with the red wine because some people had left the snacks on to try with the second wine, not really sure what the instructions were. This stop had also included tastings of olive oil, truffle flavoured olive oil and pepper flavoured olive oil, but those tastings happened along with some of the wines, so your palate was compromised. They served the pepper flavoured olive oil with the Brunello di Montalcino, but the pepper flavour was so strong that, had you tasted the Super Tuscan right away, it would have completely overpowered that wine. I stuffed my mouth with plain soda crackers and drank as much water as I could, trying to diminish the taste of pepper so that I could do the wine justice. The hostess had also asked people what they thought of the wines, in terms of a tasting evaluation, but she didn’t really like some of their answers and instead of encouraging them she just kind of shut down any discussion. Only one person had been bold enough to offer suggestions, but she told them they were wrong and that one should smell prunes (not cherry) on a Chianti Classico. That’s fine – but the wine didn’t have the rich, concentrated aroma of prune. The prices at this stop were also quite high with the cheapest bottle of wine, the Chianti DOCG, priced at €21. This apparently included all shipping and taxes, but if you wanted to buy the wine right now and walk away you would receive only a 10% discount. The math didn’t quite work out for me. Americans could get away with buying 3 bottles, but Canadians and Australians needed a minimum purchase of 6 bottles. Plus, to be honest, the wine wasn’t that great – the €21 Chianti DOCG works out to just over $30 Cdn and I can get a decent Chianti for $15-20. The truffle and pepper olive oil was also very expensive at €26 and €23. Truffle oil is also an incredibly controversial item in the food world as it gained in popularity during the 90s but has fallen out of favour. Many truffle oils aren’t even made with real truffles as chemists have found a way to replicate the taste synthetically. I left without purchasing anything, as I think most people did, especially my fellow Canadians. 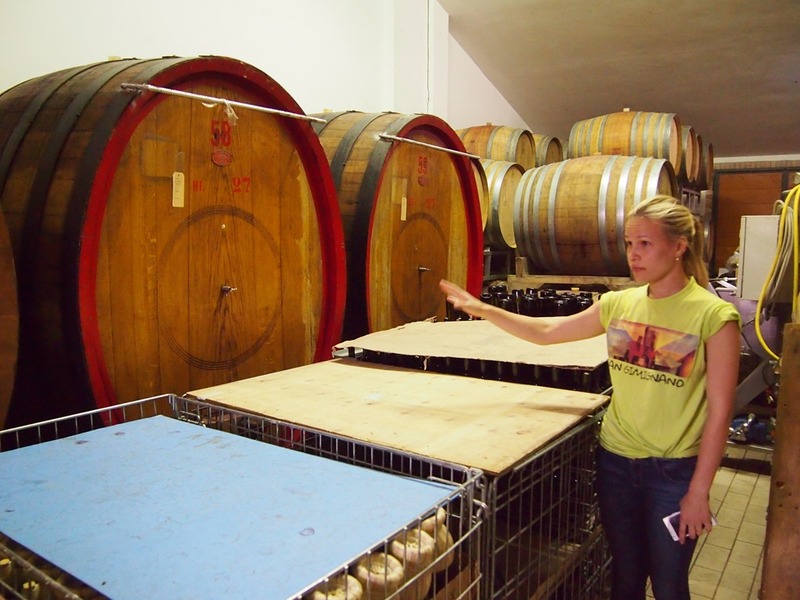 Our second stop was a small, family run winery called Pietraserena that has been in operation for just over 100 years. I much preferred this stop as we were taught about the production of the wine, from grape to bottle. This included a stop in the vineyard which contained many of their oldest vines, dating back about 40 years. Many of my fellow tour mates had never been inside of a winery before and I was glad to at least know the production process from my Vinification course (my favourite) at Algonquin with Aaron Shaw. I was brought back to those early mornings as we checked out the stemmer and the press, steel and cement fermentation tanks and differently sized oak barrels. Our guide for this stop, the petite wife of the owner, pointed one of the small holes on the fermentation tanks and told us that her first job was tank cleaner. There was a tasting table and some snacks already set up for us as we ventured outside, eager to sample and taste our way through their offerings. Once again we started with a Vernaccia di San Gimignano DOCG and we were told that in order to receive the DOCG classification the grapes had to be grown within 5km of the hill town, with the best results coming from vines located on the top of a sunny, windy hill. We moved on to taste their Toscana Rosato, a delicious rosé table wine, a Chianti Colli Sensei DOCG and, my personal favourite, a Chianti Seleccion DOCG made with 100% sangioviese grapes. These wines were a fraction of the price that we encountered at our first stop. mmmmm…. bruschette… this plate was for four of us. The food? Also important. We had a heaping plate of bruschette (mmm, Italian tomatoes) and bread with olive oil, a large green salad drizzled with flavourful olive oil, cheeses and a selection of cured meats. I can guarantee that absolutely no one came away from lunch hungry. Another aspect of Pietraserena is that they also produce and sell some gourmet food items, including honey and truffles. They have trained dogs – in Tuscany you can only use dogs as wild boars and pigs are too sensitive, therefore they also dig up the small truffles – and sold a variety of products. I bought some sliced truffles, preserved in a bit of olive oil, for both myself and my parents, along with a few tips and ideas on how to use them when I get home. I paid €10 each for the bottles, promised by my guide Nico that it was a good deal – and he was right. As I walked around in Florence and in the small Tuscan towns we visited, the price was usually at least double that. In Florence, near the Mercato Centrale, stores charged €25 for what was essentially the exact same product. Somewhat reluctantly, we finished up at Pietraserena and headed off for a short drive to the hill town of San Gimignano. We had been admiring the towers of the town for most of the day and we were conveniently dropped off at the gates by our guides. Nico gave us strict instructions with respect to gelato as San Gimignano had a world champion gelato maker within its town walls and we had to be sure to go to the right one and, if we trusted in Nico, to order the white chocolate. We followed his directions exactly, standing in a fast moving line to enjoy some world famous gelato. I was hanging out with some of the French Canadians and the girl from Australia and we headed up to the scenic view point, climbing the tower in the ruins of a castle to enjoy the view. Many of the tourists who clogged the streets of the town either didn’t know about the view or didn’t care as it was surprisingly deserted. It was worth venturing up the steep staircase as we could admire the town, marvel at the countryside and try to decide where to put our Tuscan country houses. We visited the town for exactly the right amount of time – I didn’t miss anything and I didn’t get bored – so we headed back to the gates to meet our drivers in order to head back to the Florence. We listened to some good music, settled back into our seats and just enjoyed the passing scenery. It’s very easy to see why people spend their entire vacation in the Tuscan countryside without once stepping foot in the city! You would have loved the second one, though! The wine and the hostess! This is Mom, Meg. What gorgeous pictures of the countryside. The cities are nice to visit but the smaller villages and surrounding countryside soothe your soul! And, of course, the wine helps as well! !